Harness the power of a good night’s sleep with Harness Mattress Manufacturing Co. As a family owned and operated business since 1956, our top priorities are quality products and customer satisfaction. Visit our shop today to check out our wide variety of mattress sizes and styles. When you visit one of the typical mattress stores in Harrison, AR, you’re paying extra for a middleman service that does little to benefit you. But when you choose to shop at Harness Mattress Manufacturing Co., you’ll see a big decrease in price for quality products, because we cut out the middleman and pass the savings on to our valued customers. All of our mattresses are 100 percent American made and manufactured onsite. We proudly offer a variety of sizes and styles to choose from, including memory foam, standard box spring and double-sided flippable mattresses, as well as custom made mattresses for RVs, antique beds and much more. We are a locally owned and operated small business in Harrison, AR. We manufacture our mattresses onsite, saving you the cost of a middleman. We have nearly 60 years of experience in manufacturing and selling mattresses. Our employees are knowledgeable and friendly. We put quality and customer satisfaction above all else. 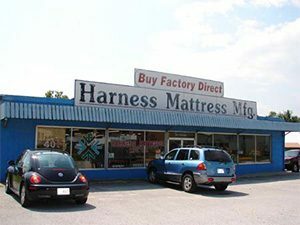 Catch the sleep you need and enjoy great savings by checking out the selection at Harness Mattress Manufacturing Co. today!